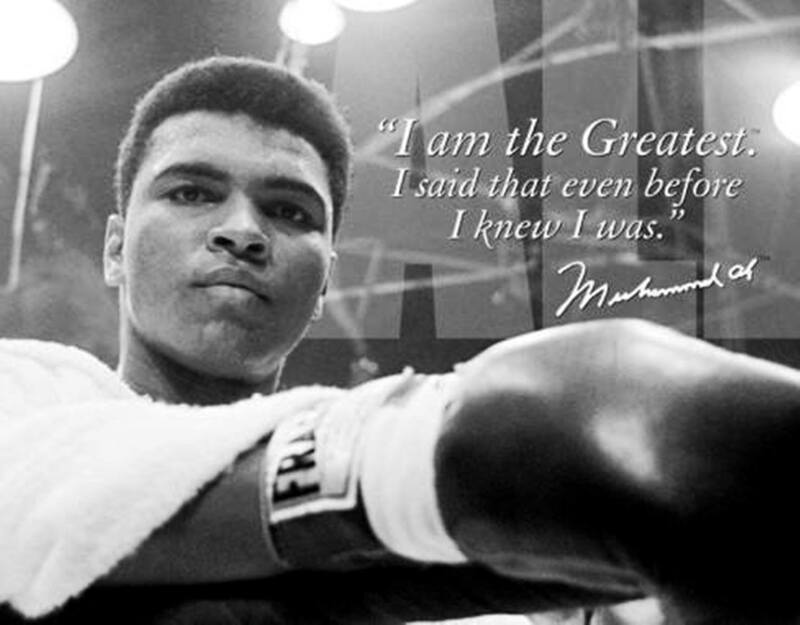 Most of us wouldn’t pay much attention to anyone who professed to be ‘the greatest’, we’d turn away and leave, but one man who said this over and over, and still captivated our attention was none other than ‘Muhammad Ali’. The man doesn’t need any introduction. Here are some of his famous quotes that if adopted by business professionals – will make you great at what you do. Ask yourself… Why do you come to work? What is your dream? What do you want to achieve? Your ‘WHY’ is what will inspire you day in day out, give you a spring in your step every morning. Your ‘WHY’ is what will give you that burning desire to succeed. Goals are necessary to provide focus in today’s hyper busy work lives. Clear goals and targets keep you from being distracted, help you avoid procrastination and most importantly allow you to measure progress. Do you know your professional goals? Have you identified all the actions, tasks, and resources needed to support you in achieving those goals? Successful people see success in their mind first. Then, they use daily affirmations to remind themselves of ‘what success would feel like” and use this as a motivation tool to achieve their objectives. Picture yourself having achieved your goal, visualise how you would feel at that time, what would it mean to you, how would it impact the lives of people around you. Despite his size, Ali was able to weave and pan around his opponent like a lightweight. He kept this distinctive style throughout his boxing career and was champion for many years. Everybody has a ‘style’ of doing things. Develop a greater level of self-awareness and improve your style if you think it will make you better at what you do. Once you find a particular style that suits you then don’t worry too much about what other people think. Let your results speak for themselves. The thing that stops people taking risks, trying new things, experimenting with new ideas is ‘fear of failure’. However, if you were to look at celebrity entrepreneurs – most of them have had some failed ventures but that is exactly what gives them the knowledge, tools, expertise, connections that help them make their following ventures successful. Identify one or two things at work that you’ve wanted to do for some time but fear that it might not work. Guess what… there is only one way to find out! Ali faced many obstacles during his life (conscripted for the war, fighting for racial equality etc.) but still he was determined to stay ‘the greatest’ boxer ever. The biggest cause of people backing off or losing motivation towards their goals is ‘doubt’. You must have the mental toughness and absolute faith that your hard work will come to fruition. The minute you start doubting yourself, or your goals or your abilities to achieve those goals – that’s when the writing will be on the wall. When it comes to your profession, put 100% of your energy and effort in your work. Don’t be a slap dash, or be content with being even the second best, aspire to be the best. Look at your recent work… Is this the best that you could’ve done? What would ‘excellent’ work look like? Successful people have high levels of emotional intelligence. As they work towards their goals they recognise and get rid of any thing that makes it difficult for them to achieve their goals. This could be people in the organisation (if you manage them) or it could simply be bad habits such as procrastination, too much time chatting, social media addiction etc. Identify the pebbles in your professional life, find a way to deal with them and move on. If you are unable to deal with the pebbles in your shoes, you are not going to get far. Business world changes faster than you think. The people and companies who continuously expose themselves to new information and different perspectives are the ones who come up with creative and innovative solutions. Let me ask… do you have a professional development plan that you ‘own’ as opposed to being enforced by someone else. What are you doing to keep yourself ahead of the curve? What was the last business book that you read? Athletes have a coach for a reason: someone to watch them and get them to be their best. In the business context, you should look to secure some coaching commitment from a senior manager (not one that you report to), an ex-colleague or even a professional business coach. If you want to go from good to great, then you will need someone who can help you become aware of your blind spots, someone you can talk matters through with and gain perspective, discuss ways to advance things faster or even support to make bold moves. Finally, I shall leave you with one Muhammad Ali quote that I’ve always cherished as a sales professional.